Tomsk, February the 8th 2019, Elecard provided CodecWorks platform for the first time in Russia 8K video broadcasting which took place at CSTB 2019. The fast-changing industry of TV broadcasting is progressing at a feverish pace and those technologies which seemed fantastic yesterday have now become ingrained in our everyday life. State-of-art TV broadcasting formats make it possible to watch video in a breath-taking quality without leaving your home. Currently, the gold standard recognized at TV broadcasting industry is an UltraHD format or 4К. Next-generation 8К format (the total image dimensions of 7680×4320) is considered to be its closest successor, having twice as many horizontal and twice as many vertical pixels as 4K. The difference between 4K and 8K is not so obvious for users with regular TV sets, however 8K striking advantages become prominent on the large TV screens used on the street or at shopping centers. “8K video broadcasting technology cannot be widely adopted by customers yet because a typical TV set does not have the required technical capabilities to receive an ultra high definition signal. Such equipment is still expensive. 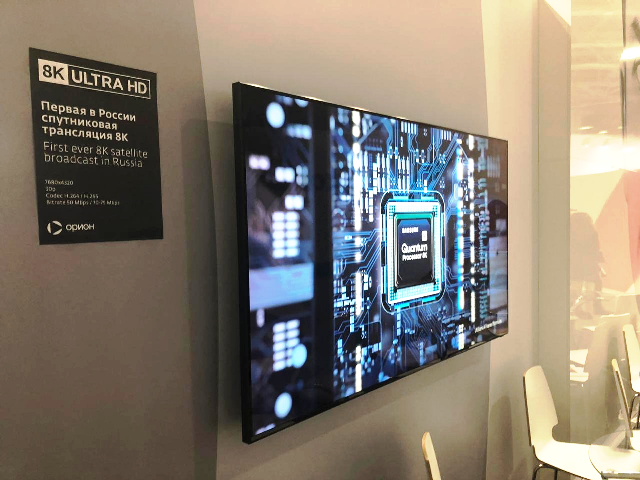 The price of the TV set used at CSTB is around 10 000 USD – it is the first production model of a consumer TV made by Samsung with resolution 7680х4320 pixels”, -comments Nikolay Milovanov, Elecard CEO. Elecard is a provider of video compression technologies (Linear, OTT, File based) as well as professional Analysis software and Embedded QoS/QoE probe technologies used to enable todays video ecosystem. Elecard supports: MPEG-2, AVC/H.264, HEVC/H.265, VPX, MPEG-Dash, HLS, AV1. Elecard Analysis tools, Encoder platforms and Codec SDK’s, enable system architects, designers and QA to shorten development cycles and improve time to market. Elecard is based in the United States, Canada, Russia and Vietnam. For more information, please visit www.elecard.com.